Winners of the 2015 DuPont Awards for Packaging Innovation have been announced – an event that’s always noticed with interest by the global packaging world. 2015, says Du Pont, will be remembered as the year of design as 77 percent of the winners were honoured for design excellence in enhancing the users’ experience. Canada-based IPS Inc earned the Diamond Award, the program’s highest honour, for SkinnyPack Technology. This mono-material package marries flexible and rigid packaging to create a thin, light, strong structure that uses less material, enables recycling and allows more message space. The DuPont Awards for Packaging Innovation is the industry’s longest-running, global, independently judged celebration of innovation and collaboration throughout the value chain. An independent panel of packaging experts evaluated nearly 140 entries from more than 25 countries and awarded one diamond winner, five gold winners and seven silver winners based on “excellence” in one, two or all three categories: technological advancement, responsible packaging and enhanced user experience. “The novelty this year lies in the fact that we saw packaging designs that added intuitive functionality in a way that was both simple and meaningful for the user,” said David Luttenberger, CPP, global packaging director, Mintel Group, USA and lead judge. 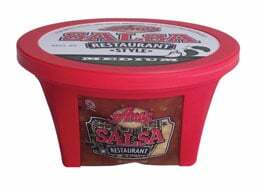 Austin, Texas-based Ana’s Foods has become the first company in North America to utilise IPL’s SkinnyPack technology container, using it to package a range of fresh salsa, Ana’s Salsa Restaurant Style. SkinnyPack is a thin, yet strong packaging technology that combines the advantages of thin, flexible film and the advantages of a strong, rigid frame. IPL’s lighter-weight, thin-walled SkinnyPack uses 54.8 percent less plastic than the company’s original salsa containers, and is 100 percent recyclable. Empty SkinnyPacks can be nested to maximise warehouse space and after use, the SkinnyPack can be easily crushed to optimize recycling space.